Review your residential bill and pay by check, credit card or Automatic Bank draft. Check out our Frequently Asked Questions to learn about payment options, usage, costs, and how to save on your energy bill. Current UCEMC Residential Rates can be found here along with forms to apply for Automatic Bank Draft service, service, the Alternate Payment program, Project Help, Budget Billing, and the UCEMC Pre-Pay Program. UCEMC is a not-for-profit cooperative owned by those it serves. Find answers to many billing and policy questions in the Members Handbook. How do I become a UCEMC member? You may download and complete a membership form below, and return it to your local UCEMC office. If you have any questions or need help completing the form, a member of our Consumer Services team will be happy to assist you when you come in to our office. Membership Fee – A $5.00 Membership Fee must be taken out in the name of the person receiving the electric service. What defines a joint membership? Please see section 1:04 in the Members Handbook for details. 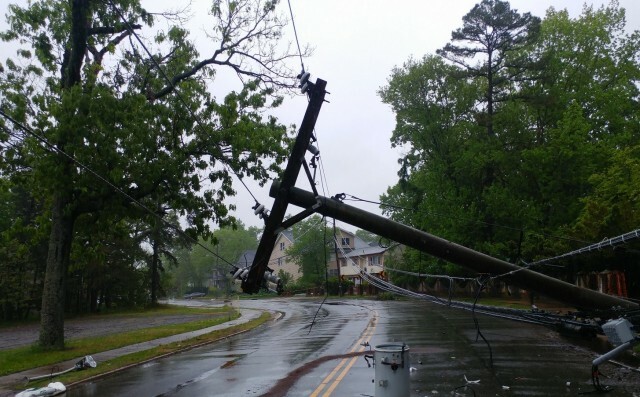 If my power goes out, how do I report it? I use gas to heat my home, why is my electric bill so high? Gas furnaces have electric-powered blowers to move the hot air through the ductwork. To help maintain the desired temperature in your home, the furnace is running for longer periods of time. Electric humidifiers used during extremely cold weather could also add to increased energy consumption. Be sure to replace heating and cooling system filters once a month. Dirty filters restrict airflow and increase energy use. Keeping the unit clean and properly adjusted will reduce energy use and save up to 5% on heating and cooling costs. Keep forgetting to do that? Tip: get in the habit of replacing your filter when you receive your monthly electric bill. I use a space heater on the coldest days, why is my electric bill so high? 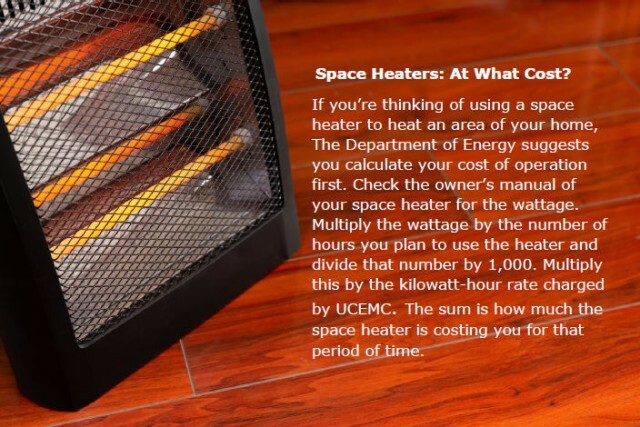 Using a space heater over long periods of time – especially in a large room - can lead to substantial energy costs. For example, a 1,500-watt space heater operating 12 hours a day will cost almost $50 each month. For more information on appliance energy costs and consumption visit ENERGY.GOV. What else could contribute to high electric bills? Do you have a heat pump? During extremely low temperatures, heat pumps switch to auxiliary or emergency heat to help heat the home and when activated, that can draw up to three times the amount of electricity. Reduce the temperature on your water heater for savings of 7 to 11%! Set the thermostat to the “normal” setting or 120 degrees, unless the owner’s manual for a dishwasher requires a higher setting. Make sure you turn off the breaker to your water heater before opening the panels. Insulate the first five feet of pipe coming out of the top of your water heater; or the entire length until the pipe goes into the wall if that is less than five feet. Check the lighting. Install Compact Fluorescent Lights (CFLs). CFLs are a good choice for home lighting because they use less energy than incandescent bulbs, produce the same output, and last up to 10 times longer. Each bulb can save $40 or more in electricity costs over its lifetime. Learn more about energy savings tips here. How can I better manage and budget my energy bills each month? *Participate in PrePay. The POWER YOUR WAY program from Upper Cumberland Electric is an option for our members seeking an alternative way to pay for their service. The program allows participants to avoid a deposit and monthly bills, customize their payment schedule, purchase energy when convenient, and monitor their own consumption. Learn more here. *How do I make my home more energy efficient? Upper Cumberland Electric Membership Corporation (UCEMC) here and the Tennessee Valley Authority (TVA) are pleased to announce eScore, a home energy improvement offer that provides homeowners with simple ways to make existing homes as energy efficient as possible. Through instant rebates on eligible improvements performed by members of the Quality Contractor Network (QCN), eScore allows homeowners to work toward a perfect score of 10 at their own pace, re-engaging with the program as many times as needed to achieve their home’s best possible energy performance. EScore is offered to residential UCEMC members. Check out the Energy Right Services below for more information. TVA provides regulatory oversight for your local power company’s rates and service practices. 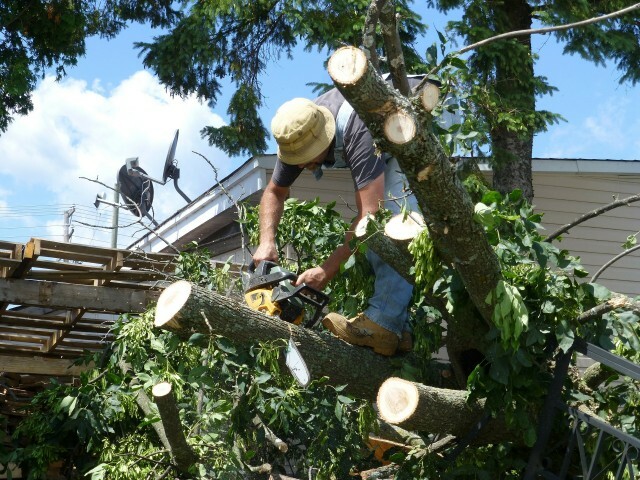 If you have an issue or complaint that you have not been able to resolve with your local power company, TVA’s Complaint Resolution Process may be able to help. Here’s a project for do-it-yourselfers that’s safe and easy: Locate smoke alarms in every bedroom, outside each bedroom, and on each level of the house. They, too, should be tested monthly and the batteries replaced annually.